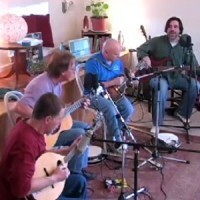 The massive New England blizzard of 2011 has me thinking about the Last Fair Deal song, New England, today. That line “when that winter wind is howlin’ growlin’ all around, you know that sound, it’s something you can count on” mademe go dig up that video we shot here at my studio playing New England live. One of my all time favorite songs to sing with the Deal. We ran mics and lines into Tom’s Korg harddisk multitrack recorder, and he just burned me a CD master file dump of all the tracks and I brought the files into Logic for mixing. We didn’t do any mastering on the final track just kept it a raw mix; sounds pretty clean.